LASD deputies and detectives quickly catch Saugus bank robbery suspect. 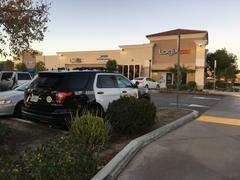 SCV Sheriff's deputies responded to the scene of a robbery that was reported at the Logix Bouquet Canyon branch Friday, December 28, 2018, in Saugus, at approximately 2:55 p.m. Initial reports indicated the suspect - described as a Hispanic man, mid-20's- handed a bank teller a note demanding money. The suspect then fled on foot with an undisclosed amount of U.S. currency. Los Angeles County Sheriff's Department Major Crimes Bureau (MCB) detectives were notified and responded to the scene. After an extensive investigation, a lead was developed. MCB detectives, assisted by deputies from the Santa Clarita Valley Sheriff's Station and Palmdale Sheriff's Station, conducted surveillance of locations known to the suspect. The teamwork paid off - at approximately 10:35 p.m. Friday, suspect Joel Salazar, M/H, 21, was taken into custody at a residence in Acton - less than eight hours from when the robbery occurred. Salazar was transported and booked at the Palmdale Sheriff's Station where he is currently being held on $50,000 bail.